Fig. Proximity Detector Circuit Diagram. The CS209A is a bipolar monolithic integrated circuit for use in metal detection/proximity sensing applications.The CS209A contains an oscillator set up by an external parallel resonant tank and a feedback resistor connected between pin 2 and 3. 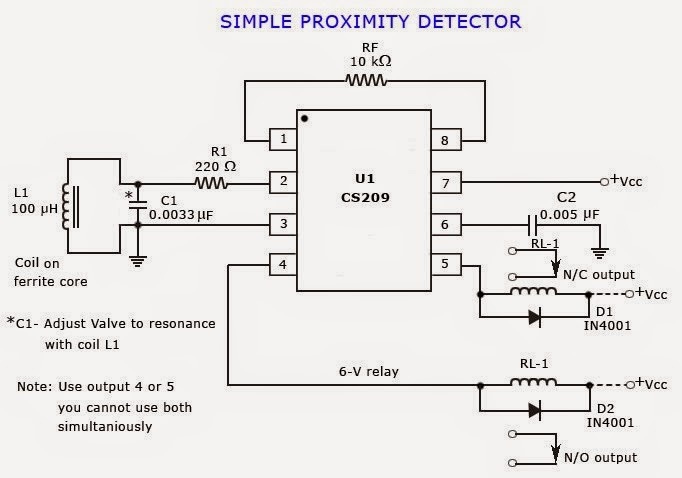 This is a simple proximity detector using IC CS209. The internal oscillator operates close to the resonant frequency of the tank circuit.As a metal object is brought close to the inductor, the amplitude of the voltage across the tank gradually begins to drop. When the envelope of the oscillation reaches a certain level, the IC causes the outputs to toggle states.potentiometer connected between pin 1 and 8 is adjusted to achieve a certain detection distance range. The larger the resistance the greater the trip-point distance.Detection range can be increased by using a high Q coil.Maximum possible range is 1 inch with a well tuned circuit.Only difficulty in making this circuit is the tuning up the circuit to a particular range.For making it easy place a metal piece at the desired distance from coil (with in 1 inch) and adjust resistance Rf to make one of the outputs ( pin4 or 5) to change state. proximity sensors are now a days widely used in mobiles also. Components list are shown above circuit diagram. 0 Response to "Proximity Detector or Proximity Sensor Circuits"